Chip Heath is the co-author of the book Made to Stick: Why Some Ideas Survive and Others Die, which has been a New York Times, Wall Street Journal, and BusinessWeek bestseller. Chip has spoken and consulted on the topic of "making ideas stick" with organizations such as Nike, the Nature Conservancy, Microsoft, Ideo, and the American Heart Association. Chip's research examines why certain ideas—ranging from urban legends to folk medical cures, from Chicken Soup for the Soul stories to business strategy myths—survive and prosper in the social marketplace of ideas. These "naturally sticky" ideas spread without external help in the form of marketing dollars, PR assistance, or the attention of leaders. A few years back Chip designed a course, that asked whether it would be possible to use the principles of naturally sticky ideas to design messages that would be more effective. That course, How to Make Ideas Stick, has been taught to hundreds of students including managers, teachers, doctors, journalists, venture capitalists, product designers, and film producers. Chip's research has appeared in the Journal of Organizational Behavior, Quarterly Journal of Economics, Cognitive Psychology, Organizational Behavior and Human Decision Processes, Journal of Consumer Behavior, Strategic Management Journal, Psychological Science, and the Journal of Risk and Uncertainty. Popular accounts of his research have appeared in Scientific American, the Financial Times, The Washington Post, Business Week, Psychology Today, and Vanity Fair. He has appeared on NPR and National Geographic specials. What is that makes urban myths so persistent but many everyday truths so eminently forgettable? How do newspapers set about ensuring that their headlines make you want to read on? And why do we remember complicated stories but not complicated facts? 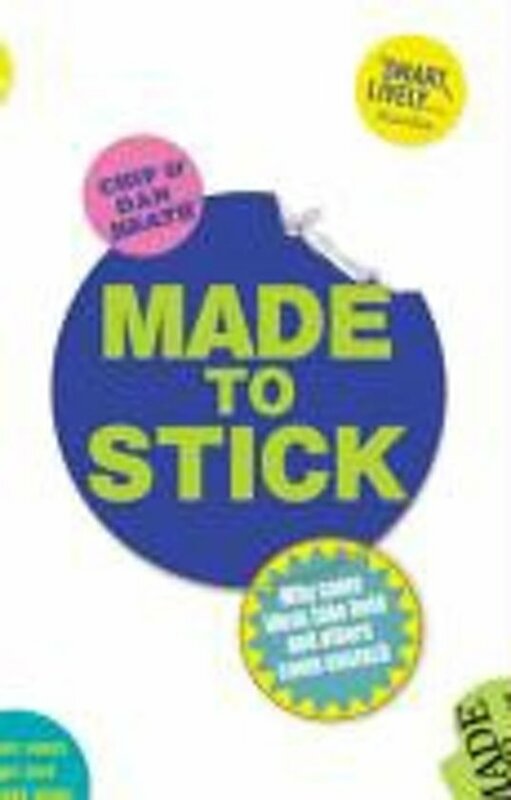 In the course of over ten years of study, Chip and Dan Heath have established what it is that determines whether particular ideas or stories stick in our minds or not, and Made to Stick is the fascinating outcome of their painstaking research. Packed full of case histories and thought-provoking anecdotes, it shows, among other things, how one Australian scientist convinced the world he'd discovered the cause of stomach ulcers by drinking a glass filled with bacteria, how a gifted sports reporter got people to watch a football match by showing them the outside of the stadium, and how high-concept pitches such as 'Jaws on a spaceship' (Alien) and 'Die Hard on a bus' (Speed) convince movie executives to invest vast sums of money in a project on the basis of almost no information. Entertaining and informative by turns, this is a fascinating and multi-faceted account of a key area of human behaviour. At the same time, by showing how we can all use such cleverly devised strategies as the 'Velcro Theory of Memory' and 'curiosity gaps', it offers superbly practical insights, setting out principles we all can adopt to make sure that we get our ideas across effectively. Leuk boek met een mooie structuur en vele leuke en grappige voorbeelden. Het boek is in het Engels maar de vocabulaire is niet te moeilijk om te verstaan. Het enige nadeel aan deze versie is dat het niet zo goed in de hand ligt.